Spiral Dynamics Integral gives insight in the various value systems (or values, motives, and/or colors) of people. Value systems reflect the preferences in different worldviews, assumptions and intrinsic motives in people and in organizations. They differ per person and are determined by a person’s neurological “wiring’ (talents and upbringing) and the perception of their life conditions. Intrinsic motives strongly determine our perception, our thoughts, our emotions, our actions and our avoidance mechanisms. Value system show how people think and why we do as we do. Value systems should not be confused with behavior. People’s behavior is visible in the outside world, and value systems are the invisible driving forces behind this behavior. The values that we deem important (valuable) as a human being largely determine our behavior. We can see the value set that we have (and which we see as the truth) in coherence with a system, a paradigm. A paradigm is a coherent system of values, which form a framework from which the ‘reality’ is analyzed and approached. The original work by Clare Graves, Don Beck and Christopher Cowan defines 8 unique value systems, which are all color-coded. You can find a graphical representation of the 8 value systems below. Please click on the color of the value system in the main menu to read more about each value system. You can find some general characteristics about value systems below the image. Value systems are sometimes also called wMemes, Stages of Consciousness, Levels of Consciousness, Frames of Reference, Phases in Conscious Development or World Views. Value systems are the deep-seated motives, levels of existence, worldviews, modes of life, codes of behavior and values by which people and cultures live by. Value Systems may be seen as a perspective of the world, from which a person deducts a couple of principles about what is good, bad, important or unimportant. Value Systems represent a way of thinking (a truth) in relationship to norms and values, philosophy, family, religion, fashion, music, literature, politics, sports, life-style and language. Value systems are the product of the interaction between someone’s life conditions, someone’s neurological capacities and its context. Value systems can manifest in a healthy or in an unhealthy way. Every person has a combination of different value systems. You are not a color, you HAVE different colors. 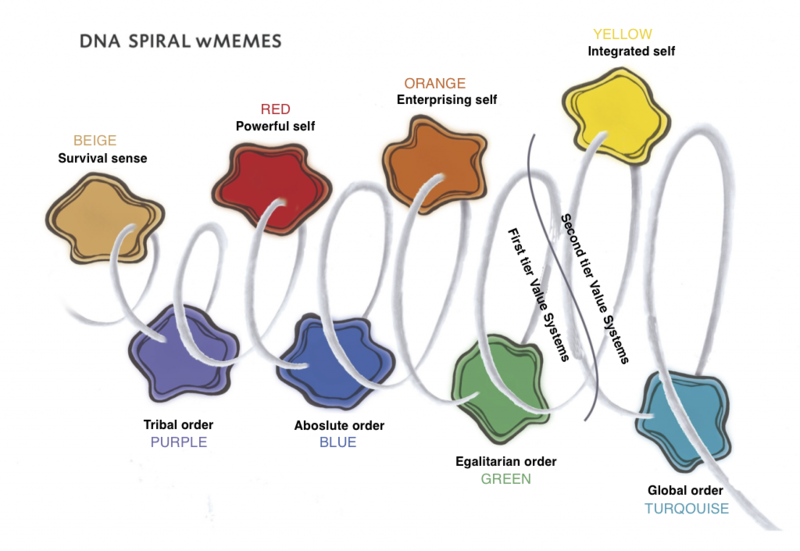 There is a continuous interplay between the more individual-oriented (Beige, Red, Orange, Yellow) and the more collective-oriented (Purple-Blue-Green-Turquoise) wMemes. To describe the colors on the pages about value systems, we have not only used elements from our own work but also elements from books and articles, amongst others definitions and parts of texts, by Don Beck, Peter Merry, Paul Zuiker and Wilbert van Leijden.